Dutch pressed music cassette. Black cassette with gold text. 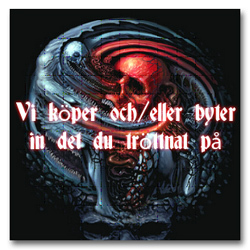 Cirith Gorgor 2.0: reborn, darker and stronger. From the past comes the storm. 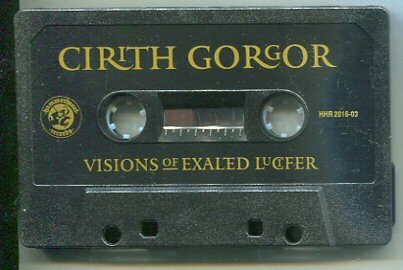 Cirith Gorgor’s origin and roots go deep back into time, and can be traced back to the beginnings of the Dutch black metal scene. With their debut demo “Mystic Legends” Cirith Gorgor gets noticed, and soon legendary French label Osmose Productions makes a deal with these Dutch devil worshippers. Cirith Gorgor become the name in the quickly rising Dutch Black Metal scene. In those earlier years of Cirith Gorgor the band releases two classics, but by the beginning of the 21st century a conscious return to the underground starts to make them less visible. During those years the Cirith Gorgor signature remains true to the black metal stamp of the highest quality, with several releases keeping the band alive and staying on their darkened path. Their 2016 album, Visions Of Exalted Lucifer, shows a band that has been reborn in a much stronger form to take all followers of the dark black metal cult by surprise.